“Chasing Coral,” a new documentary that has just dropped on Netflix, chronicles the effects of climate change on coral reefs. The phenomenon is the death of massive sections of coral reefs due to increases in the temperature of the oceans. The process has been observed since the 1990s and is continuing unabated. According to Live Science, a coral reef is formed of tiny, soft bodies coral polyps that feed on algae and other microorganisms. The reefs, such as the Great Barrier Reef off the coast of Australia, are a riot of color and constitute thriving ecosystems when they are healthy. However, when the temperature of the surrounding ocean rises, the reefs start to expel the microorganisms, giving the reefs the white color that gives rise to the term used to describe the phenomenon, bleaching. If the process persists for too long, the reefs die. According to “Chasing Coral” far too many coral reefs have been dying off due to climate change. Three global bleaching events have occurred, one in 1998, the second in 2010, and the third between 2014 and 2016. Some coral formations have proven to be more resistant to the process and have survived. Scientists are also working on mitigation strategies that will preserve more of the reefs. 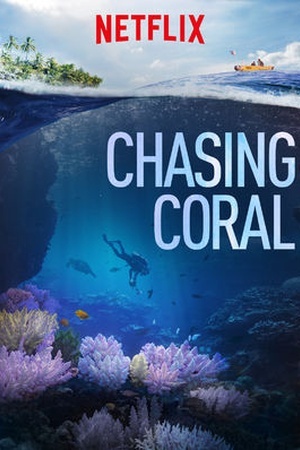 However, “Chasing Coral” takes the view that the ultimate thing to be done to stop the worldwide destruction of coral reefs is to start addressing climate change. Climate change, according to many scientists, is a process that warms the Earth’s temperature as more greenhouse gasses, carbon dioxide, are pumped into the atmosphere from the use of fossil fuels. Both the theory and especially measures proposed to address the problem have proven to be very controversial. Some, even in the climate science community, have suggested that human-caused climate change has been hyped as a problem. Some of the solutions, which include the wholesale transition from fossil fuels to renewable energy, have proven to have economic consequences that many find difficult to bear. Nevertheless, “Chasing Coral” provides a visual representation of the effects of climate change that is hard to argue with or turn away from. Time-lapse cameras show the transformation of colorful, vibrant coral reefs into bleached, white, dead zones. Unfortunately, according to a recent article in the journal Nature, even the most optimistic scenario suggests that the world is going to lose one-third of its coral reefs to degradation. The number increases to two-thirds under less optimistic estimates.